Life expectancy rises. Wages stagnate. Retirement accounts shrink. Guaranteed monthly pensions are an endangered species. The average U.S. age for men retiring from work has gradually increased to 64. Yet age 62 continues to be held out as the popular standard, perhaps because that’s Americans’ marker for Social Security eligibility. Is retirement at age 62 destined be a casualty of dovetailing medical, financial, economic and even political trends? Many baby boomers are already postponing retirement into their mid- or even late 60s. One study found that claiming Social Security at 62 is becoming less popular, a trend that is expected to continue despite the hardships of the Great Recession. “I don’t think it’s dead, but its health has eroded,” Chuck Miller, a Chicago communications consultant who specializes in retirement, said about age-62 retirement in this country. Wisconsin’s failed recall election for Governor Scott Walker suggested growing U.S. voters’ disdain for generous pensions and early retirement ages, even as Europeans protest government proposals to raise public employees’ retirement ages. 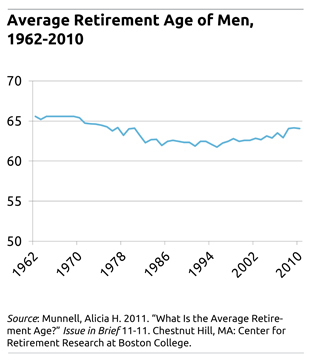 Rhode Island has already raised its employee retirement age to 67, from 62 previously. And voters in San Jose just approved measures to scale back public worker pensions that included an increase in the retirement age. Squared Away readers, where do you stand? Have you or will you retire at age 62? Tell us about your situation or your theories! 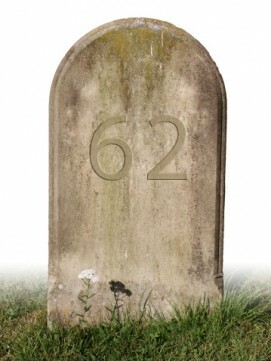 8 Responses to Is 62 Dead (as a Retirement Age)? I am 65 1/2, going out at 65 3/4. I want to travel while I can. My personal take on retirement is that I do not believe in retirement. There is much to be done in this world we live in, and I believe in the philosophy of moving from “success to significance.” I personally spent 30 plus years as an entrepreneur, corporate executive, and private investor. I am now teaching, writing, and researching full time at a major university. I believe I can add value to the young people looking to complete their education and start their careers by bringing real world experience to the classroom. I am blessed to have this opportunity and would encourage others who want to do more than travel, play golf, and spend time with family to consider the same direction. I have plenty of time to do all those things and more and consider that as extremely important as I have five living children, 13 grandchildren, and 1 great grandchild. Life is good. We are only remembered for what we give back, not for how much we have. How do you want to be remembered? My original plan to retire at 62 was stymied when my job was cut in 1998, at age 54. I survived three years before I was employed again. In 2007, I found a higher paying job that would increase my Social Security benefits, making up for the years lost (’98-01). I retired at 67 with almost the max in Social Security, which makes up about 1/3rd of my living expenses. At 68, I have no debt and a new house. It wasn’t easy but it is worth it. In a word, yes. There is no credible medical coverage between 62 and Medicare. Therefore, everyone without coverage is continuing to work for the employer-provided catastrophic medical benefits. Also, the bang-for-the-buck to wait on collecting Social Security is too good to pass up, so working longer is my plan. I am 64. I will be 65 next March. My employer is allowing me to cut my work load to 80% next year, so I’ll be able to still work, but taper off. I plan to NOT take Social Security until later – at least 67, 68, or even 70 if possible, even if that means drawing some of my 401(k) out to tide us over. In this day and age, people are doing things later and later in life, retirement being one of those things. At 62, people are still capable of doing many of the things that they were able to do before this “retirement age.” We work with many people in assisted living situations, and we know firsthand that many of them are still able to do many of the jobs they were doing before retirement. I’m a 49-year-old female. For most of my adult life I’ve been a non-paid mom and military spouse moving every 3-5 years. For the past 10 years, I’ve been a teacher working for the U.S. Gov’t. I remarried three years ago to a retired U.S. Marine. Between us, we’ve got 6 kids and 2 grandchildren. Right now, I’ve got a great paying job in Germany and am socking away all I’m allowed to for retirement. The day I hit my minimum retirement age, I’m gone. I look forward to traveling, gardening, spending time with my grandkids, and volunteering at church, the American Red Cross and USO. My first husband died of a heart attack at 49-years-old, and my current husband lost his first wife to MS at 50-years-old. I don’t save my china or crystal (or anything) for special occasions. Life is too short! I say, “eat the pie first and maybe have room for the veggies.” I retired at 62 and love traveling and playing with my grandchildren (7 girls). I am not rich with money, but with fun!! I retired at 58 with 32 years at auto factory (early buyout). I’m 62 now, living well, never touching my savings. Don’t wait too long to give up the greed. Too many friends dropping dead in their mid 60’s, shoulda woulda coulda.